The latest leaks of the new phone Nokia 9 pure viewgives us the detail about the look of the phone. Thanks to the long anticipated launch of this phone. The leaks show that the phone will have a complete penta-lens rear camera set up at the front with thin side bezels. The images are said to be the official press release and the claim that the handset will come up with a very unique blue color finishing and an in-display fingerprint sensor. 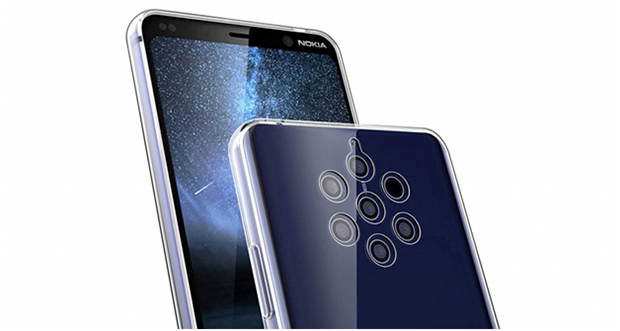 The new Nokia 9 pure view is said to the latest handset of its kind with a penta-lens rear camera set up. The leaked images prominently shows android one branding on the rear panel and an in display fingerprint sensor. The ear piece is situated in the up center of the phone and the Nokia branding at the right side corner of the handset. Front camera is on the opposite side. HMD Global has scheduled an event on February 24 ahead of MWC 2019 where the company is expected to launch the Nokia 9 Pure view, and if a leaked teaser is anything to follow, the company is expected to launch the five camera-toting Smartphone later this month. The depicted design in alleged press of Nokia 9 pure view follows the previous leaks that show its various angles. Interestingly, the leaks of the high end Nokia have some similar features like the previous handsets. The latest leaks does not reveal all the details about the phone but some important details such as support for 18W fast charging and vanilla Android Pie on the software side. The other rumors about the specifications include a 5.99-inch QHD Pure Display panel with HDR10 support, 6GB of RAM and 128GB of internal storage. It is not confirmed about the processor because the leaks are divided between Qualcomm's year-old Snapdragon 845 SoC and the latest Snapdragon 855 SoC. The resolution of the camera is not confirmed although the phone will contain a penta-lens camera array to collect 10 times more light compared to a conventional sensor and deliver superior low-light photography results.